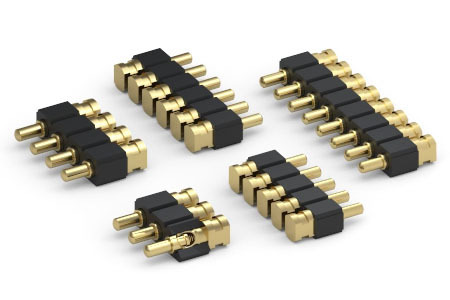 Mill-Max introduces the new 810 series Horizontal SMT Spring-loaded Connectors. 810 series connectors are ideal for low profile spring interconnections parallel to the board surface. Applications are recharging modules, grounding points, test points and board edge-to-edge interfaces, typically to our mating target connectors. View its 399 mating target connector. Utilizing Mill-Max's state-of-the-art, high quality precision-machining technology, these durable spring pins are designed to assure a 1 million cycle life minimum. Rated at 2A continuous (3A peak), the pins are plated 20µ" gold over nickel on the piston and base, with 10µ" gold over nickel plating on the beryllium copper internal spring. The .045" (1,14mm) mid-stroke allows for .025" (0,64mm) more travel than most standard series spring pins, yet the overall length when compressed to mid-stroke is a compact .252"(6,4mm) Also, the pins are mounted on .100" (2,54mm) pitch in high–temperature thermoplastic insulators–suitable for all typical reflow soldering processes. These highly reliable horizontal surface mount spring pin connectors are available in up to 10 positions.